The Guru is both external and internal. From the exterior he gives a push to the mind to turn it inwards. From the interior he pulls the mind towards the Self and helps in the quieting of the mind. That is the Guru’s grace. There is no difference between God, Guru and the Self. The most important thing a spiritual Master does for his spiritual children is to make them consciously aware of something vast and infinite within themselves, which is nothing other than God Himself. Guru is a Sanskrit word which means “he who illumines.” The one who offers illumination is called a Guru. According to my own inner realisation I wish to say that there is only one real Guru, and that is the Supreme. No human being is the real Guru. But although the Supreme alone is the real Guru, here on earth we value time. If we Find someone who can help . us on our journey towards illumination, we take his help, and we may call him our Guru. A spiritual Master or Guru is like the eldest child in the family, and the seekers are like his younger spiritual brothers and sisters. Spiritual Masters tell and show their younger brothers and sisters where their Father, the Absolute Guru, is. 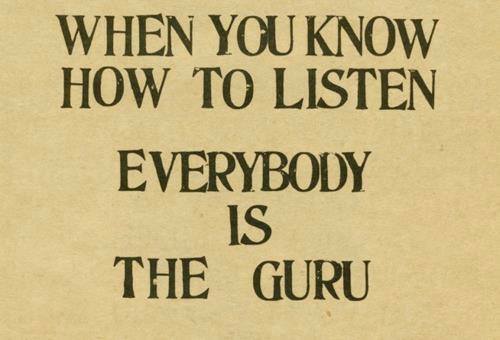 The real Guru is not in the vast blue skies. He is inside the very depth of our heart. You may ask, “If He is inside our heart, then why is it necessary for us to take help from somebody else to find Him?” Although this invaluable treasure is inside our heart, we cannot see it or feel it, so we need help. A friend of ours, who we call our Guru or spiritual teacher, comes to us and teaches us how to find our own treasure. It is not obligatory to have a living Guru, but it is certainly advisable. You know that there is a goal, and you want to reach that goal. If you are wise, you will accept help from someone who can show you the easiest, safest and most effective path to the goal. If you want to take hundreds and thousands of years to realise God, having a spiritual Master is not necessary. But if you want to reach the goal as soon as possible, then certainly it is a necessity. If you have a Master, it facilitates your inner spiritual progress. A spiritual Master is your private tutor in the spiritual life. There is a big difference between a private tutor and an ordinary teacher. An ordinary teacher will look at a student’s paper and then give him a mark. He will examine the student and then pass him or fail him. But the private tutor personally encourages and inspires the student at home so that he can pass his examination. At every moment in life’s journey, ignorance tries to examine you, but your private tutor will teach you how to pass the examination easily. It is the business of the spiritual teacher to inspire the seeker and increase his aspiration so that he can realise the Highest as soon as possible. In order to learn anything in this world you need a teacher in the beginning. To learn mathematics you need a teacher. To learn history you need a teacher. It is absurd to feel that for everything else in life you need a teacher, but not for meditation. Why do people go to the university when they can study at home? It is because they feel that they will get expert instruction from people who know the subject well. There have been a few, but very few, real men of knowledge who did not go to any university. Yes, there are exceptions; every rule admits of exceptions. God is in everybody, and if a seeker feels that he does not need human help, he is most welcome to try his capacity alone. But if someone is wise and wants to run toward his goal instead of stumbling or merely walking, then certainly the help of a Guru will be immeasurable. Right now, perhaps, I am in London. I know that New York exists and that I have to go back there. What do I need to get me there? An airplane and a pilot. In spite of the fact that I know that the plane can take me to New York, I cannot get there without the help of the pilot. Similarly, you know that God exists. You want to reach God through meditation, but someone has to take you there. As the pilot takes me to New York, someone has to take you to the consciousness of God which is deep within you. Someone has to show you how to enter into your own divinity through meditation. A spiritual Master comes to you with a boat. He says, “Come. If you want to go to the Golden Shore, I will take you. Moreover, once you get into my boat, you can sing on the boat, you can dance, you can even sleep; but I will bring you safely to the Shore.” If you say that you do not need anybody’s help, if you want to swim across the sea of ignorance alone, then it is up to you. But how many years, or how many incarnations will it take you? And again, after swimming for some time you may become totally exhausted and then you may drown. Without a Guru, your progress will be very slow and uncertain. You may get high, elevating experiences and not give them adequate significance. Or doubt may enter your mind, and you may think, “I am just an ordinary person, so how can I have that kind of experience? Perhaps I am deluding myself.” Or you will tell your friends about your experiences, and they will say, “It is all a mental hallucination!” But if there is someone who knows what the inner reality is, he will be able to assure you that the experiences which you have are absolutely real. The Master encourages the seeker and inspires him. And if the seeker is doing something wrong in his meditation, the Master is in a position to correct him. Once you complete a course, you no longer need a teacher. If you want to learn how to sing, you go to a singer and learn from him. If you want to be a dancer, you go to a dancer. Once you become a good singer or dancer, you don’t have to go to the teacher anymore. In the spiritual life it is the same. You need help in the beginning, but once you become extremely advanced, you will not need anybody’s help. If someone becomes a true disciple of a Master, he does not feel that he and his Guru are two totally different beings. He does not feel that his Guru is at the top of the tree and he is at the foot of the tree. No! He feels that the Guru is his own highest part. He feels that he and the Guru are one, that the Guru is his own highest and most developed part. Therefore, a true disciple does not find any difficulty in surrendering his lowest part to his highest part. It is not beneath his dignity to be a devoted disciple, because he knows that both the highest and the lowest are his very own. He who inspires you is your real teacher He who loves you is your real teacher. 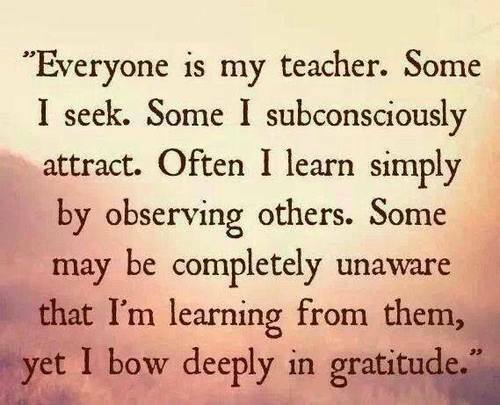 He who forces you is your real teacher. He who perfects you is your real teacher. He who treasures you is your real teacher. Initiation into silence is the most perfect initiation; it comprises looking, touching and teaching. It will purify the individual in every way and establish him in the Reality. Silence is the most potent form of work. However vast and emphatic the scriptures may be, they fail in their effect. The Guru is quiet and peace prevails in all. His silence is more vast and emphatic than all the scriptures put together. Silence does not mean negation of activity or stagnant inertness. It is not a mere negation of thoughts but something more positive than you can imagine. The one Self, the sole Reality, alone exist eternally. When even the ancient Master, Dakshinamurti, revealed It only through speechless eloquence, who else could convey it by speech or with words? The silence of the Self is ever there. As long as you run with the running mind you cannot have it. It is a Supreme peace, immutable like a rock, that supports all your activities, in fact, all movements. It is in this silence that God and the liberated souls are rooted. Contact with a enlightened sage is good. They will work through silence. By speaking their power is reduced. Silence is most powerful. Speech is always less powerful than silence, so mental contact is the best. True realisation is to cherish with one’s understanding, without any obstruction, the first cause of all that is, that silence which is liberation. The perfect silence in which the ego, the root, has been destroyed is the true nature, which will never be vanquished. The eminent and powerful state of silence can be reached in the Heart only by attaining the Self-state, the unmoving axis. Only silence, which is the end point of jnana [the direct knowledge of the Reality that is the Self], is that true vision which is the profound truth of Vedanta. Silence is the ocean into which all the rivers of all the religions discharge themselves. It is the speech of the Self. Silence, the unique language, ever surging in the Heart [a synonym for the Self], is the state of grace. In silence one is in intimate contact with the surroundings. In the state of silence one merely abides as ‘I-I’. Apart from this, there is neither thinking nor knowing. Silence will manifest itself when the clarity of Self-knowledge, which overflows with the exalted direct experience, causes the trinities of seer-seeing-seen and knower-knowing-known to depart. If the trinities that have risen from silence subside in silence, then bliss will arise. A mind that has experienced the light of silence will not readily accept the conceptual drama, consisting of the trinities, that appears in the other light [chidabhasa]. It is the mind that is diminished when there is a feeling of deficiency. In the fullness of silence, there is only consciousness, but no thoughts. That bliss that grows in the field of silence is not attained and experienced in any other field. Those who have seen the light of silence are without any attachment to the world, which is an infatuating snare that rises from the “I am the doer” idea, the feeling that there is a person who is performing the actions that the body engages in. The feeling of remaining young forever is attained in nothing else other than silence, the blossoming of Truth. Since it is thought that creates a sense of deficiency, only thought-free silence is fullness. In order to attain the Supreme state of silence, that which is worthy of attainment by seekers of Truth is the loss of individuality. You should know that the Supreme state of liberation exists only in a mind who has attained the state of silence and nowhere else. The concept-free experience of the vast emptiness of silence will rise, putting an end to the delusion of the ego, the deceiving fixation. The direct experience of the Self, silence, is the axis of everything. This is the summit, the highest good. Those who have sunk deeply into the ocean of silence and drowned will live on the summit of the Supreme mountain, the expanse of consciousness. From silence came thought, from thought, the ego, and from ego, speech. So if speech is effective, how much more so must be its source? The pure state [turiya] exists and shines as unceasing pure being in the Heart after the other thoughts that rise from oneself and the Self-forgetfulness that is the basis for their rising are fully destroyed. Clinging to that pure state, which remains without any attachments, is clinging to divine grace. This alone is one’s own state of silence wherein naught else exists. To know and to merge in this state of silence through practice of Self-enquiry, and to remain always as That, is true mental worship. This you should know. Take either God or Guru as your Lord. Until you attain liberation, keep in your Heart the conviction that you are his subject. Remain without desires and live according to his command. Oh foolish mind, why do you forget this and get deluded? Remaining quiet is what is called wisdom-insight. To remain quiet is to resolve the mind in the Self. Enthroning the Lord upon the seat of the Heart and fixing the whole mind at his feet, worship him as your own Self, without a sense of difference, because He is your own true nature. You should know that true worship, performed naturally and without a break, is the fair nature of divine silence. The inner silence is self-surrender. And that is living without the sense of ego. Subjugation of the mind is meditation; deep meditation is Eternal speech. Silence is ever-speaking; it’s the perennial flow of ‘language’. It is interrupted by speaking; for words obstruct this mute ‘language’. Silence is permanent and benefits the whole of humanity. Oral lectures are not so eloquent as silence. Silence is unceasing eloquence. It is the best language. Which is the better, to preach loudly without effect or to sit silently sending out inner force? Know that Self, which is to be enquired into and attained in the Heart as the state of happiness through the requisite tapas or Self-attention, is only the state of silence, which is experienced by removing the delusive and worthless knowledge of differences along with its root, the ignorance or wrong knowledge “I am this body”. The state of the experience of the one non-dual silence, which is attained as the experience of the unlimited true knowledge, is only the shining of oneself as the empty space devoid of the false imagination which is the rising of the wicked ego-mind. Since the silence of Self, which shines through the pure mind [the pure existence-consciousness which is devoid of all thoughts], alone turns out to be the gateway to liberation, even though they proceed along any path which is agreeable to them, that gate alone is the final refuge. Attending unceasingly and with a fully concentrated mind to Self, which is the non-dual perfect Reality, alone is the pure Supreme silence; on the other hand, the mere unthinking laziness of the dull mind is nothing but a defective delusion. Know thus. Know that the inner silence – the undecreasing strength of unceasingly praising and worshipping, without worshipping, the Feet of Lord Shiva by the beautiful Supreme word [paravak], which is the pure unrising speech [that is, worshipping by Self-attention, the non-rising of the ego] – alone is the true and natural worship of the Reality. Salutations are to that glorious Guru who is the very beginning of the Universe, yet who is eternal without a beginning, who is the supreme Divine and to whom there is none superior. There is no higher truth than the Guru, no higher penance than (service to) the Guru, and there is nothing higher than Realisation of the Knowledge of the truth imparted by the Guru. My salutations to that glorious Guru, who is himself that very timeless truth (and who has taken up a form to bless his disciples like us with real knowledge).